The SLP in Long-Term Care is a 2-hour online continuing education (CE/CEU) course that provides an overview of speech-language pathology services in skilled nursing facilities. As the population of the United States ages, more healthcare professionals find themselves treating elders. Schools, private practice, and hospitals will always be major practice settings, but the demographics of our country point to a growing need for geriatric treatment. 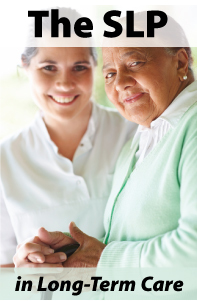 In 2014 there were an estimated 1.5 million people in 16,000 skilled nursing facilities. By 2030 this number may be as high as 2.6 million. There is a significant need now for treatment provided by speech-language pathologists in the skilled nursing facility setting which will only grow in the years to come. Every practice setting has unique characteristics that affect clinical practice. Skilled nursing facilities have a multitude of regulations, complicated billing practices, and a culture of care that must be learned and integrated into the SLP’s treatment habits. This can make it difficult for the SLP working part-time or PRN in a skilled nursing facility. This entry was posted in CE Courses, Speech-Language Pathology CEUs and tagged ASHA, CE, CEUs, continuing education, Online Courses, Professional Development Resources, SLP, SLPs, Speech Language Pathology, The SLP in Long-Term Care, The Speech-Language Pathologist in Long-Term Care by Gina Gunderson. Bookmark the permalink.